Starting today, the Escada sample sale kicks off at the normal location. Up to 90% off dresses, gowns, shoes, handbags, tops, bottoms, etc. New merchandise daily. All sales are final, no exchanges, or returns. No strollers or children under 12 please. 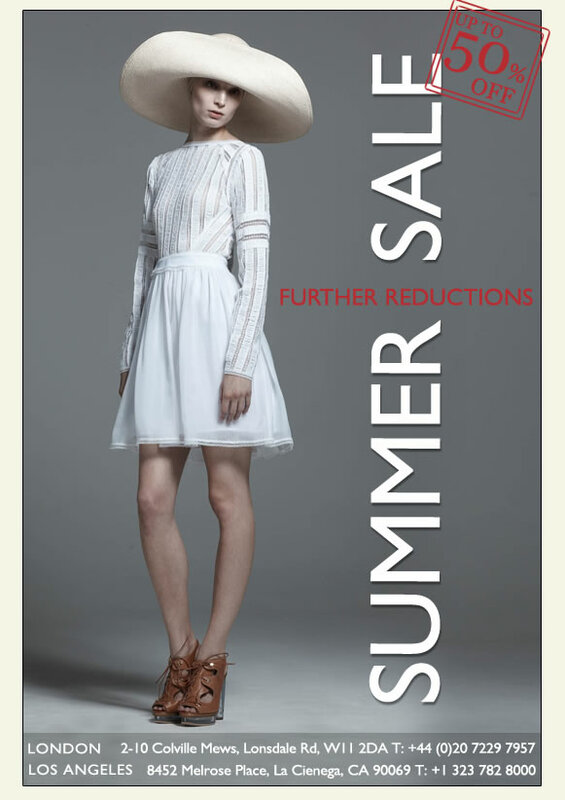 MyTheresa.com has launched their summer sale in full force: more reductions and more items. From my inbox... Dyson is having a private sale! My little dog sheds equivalent to the amount a woolly mammoth would, and having an Animal has been a true lifesaver. It's going on 7 years strong-- a WONDERFUL investment! No code needed, ends Monday, Jul 4. Nordstrom has kicked off their half-yearly sale for men, and they've bundled it with a summer sale for the ladies as well. In celebration of their birthday, YOOX.com is doing 15% off everything. 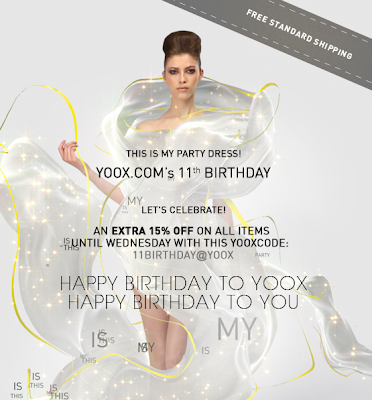 Use code "11BIRTHDAY@YOOX" until Wednesday, Jun 22. Free shipping too! James Perse has started a private sale online. For girls, quite a lot of variety, although some of the more desirable pieces are only in size 1. The boys actually have a much larger selection of polos and long-sleeve tops. Earlier this month I met a future fellow classmate who currently works for NAP! So, needless to say, I support them more than ever ;) Like I needed an excuse, though. Ha! Another round of price reductions = a lot of very affordable designer bikinis and more! 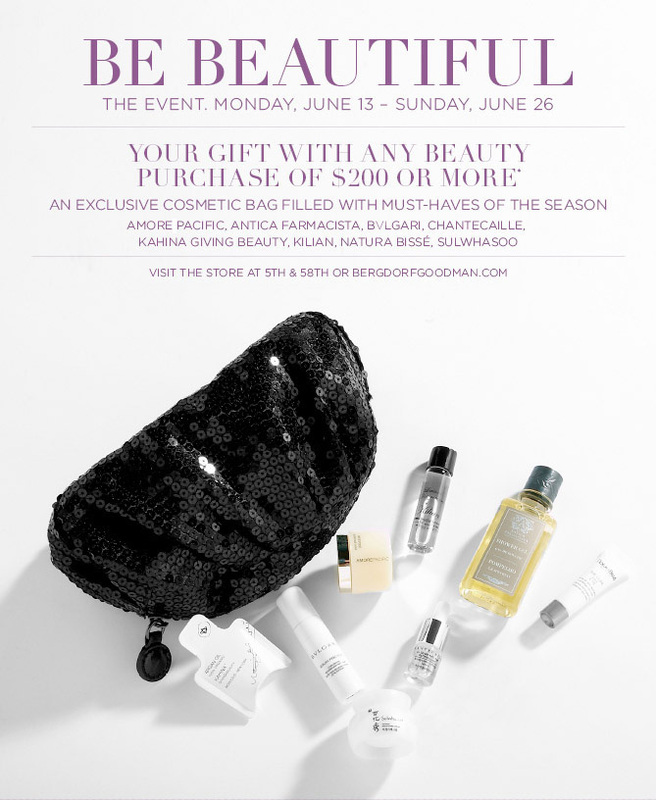 Bergdorf Goodman is giving away a pretty nice little gift for $200+ spent in beauty. Get the goody bag and free shipping with "BEAUTYFS". Ends Sunday, Jun 26. Nordstrom has started their final clearance, and although most items hover at 33% off, there are a few things up to 55% off. They are also running a beauty goody bag promotion that looks pretty good. Spend $100+ and get $70 worth of freebies, including a Deborah Lippmann nail polish. 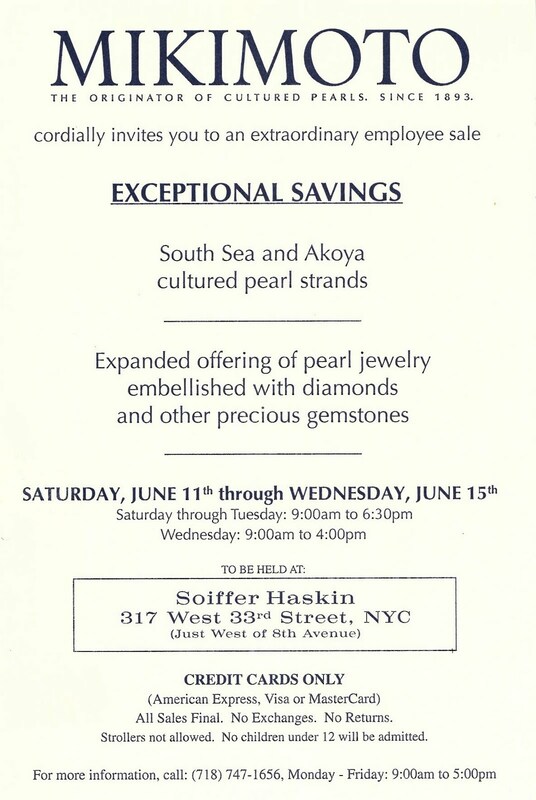 One of the most awaited sample sales of the year for jewelry lovers. 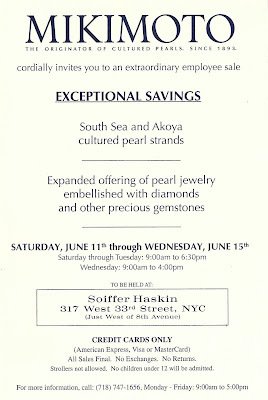 Look for South Sea and Akoya cultured pearl strands and other piece of pearl jewelry with gemstones. I have heard of fantastic deals, like $50,000 strands being sold for $30,000. That being said, you can also get some beautiful pieces for $500-1000. Starting today in boutiques, Catherine Malandrino's F&F event! Basically it's the outlet store in the stores. Prices of select SS Catherine Malandrino and Malandrino items are up to 75% off! I always go nuts in the outlet store, so I'm dying to go, but a little afraid of the damage I would do! Ends Sunday, Jun 12. Calypso St. Barth's online sample sale starts today. Take an extra 50% off the sale merchandise using code "SAMPLESALE". They're also offering the discount at their boutique in Soho (426 Broome St). Hi there, this past week has been, I promise, my AWOL for the next 2 months :) I went to Fontainebleau to secure an apartment and attend INSEAD Open Day, and also spent a couple of days in Paris for the first time in my life. I know, I can't believe it's taken so long either. I love how the French girls live up to stereotype: slim and trendy, lots of horizontal stripes, with a noticeable percentage wearing linen scarves, and 80% of them wearing ballet flats. As much as I love wearing flip flops for comfort, I think they are too casual, and I did not see one pair of flip flops on the streets of Paris. And it was HOT too!! If the girl wasn't wearing ballet flats, they were flat gladiator sandals or leather strappy sandals. Not as many high heels as I would have thought, either, so comfort is definitely a global consideration. Most of my scarves are silk, so I will need to acquire some linen ones, but I scored a new pair of Repettos from Orly duty-free for only 128€ (~$185 USD). But now that I know what the style is over there, I can begin to align my shopping habits to my new home. 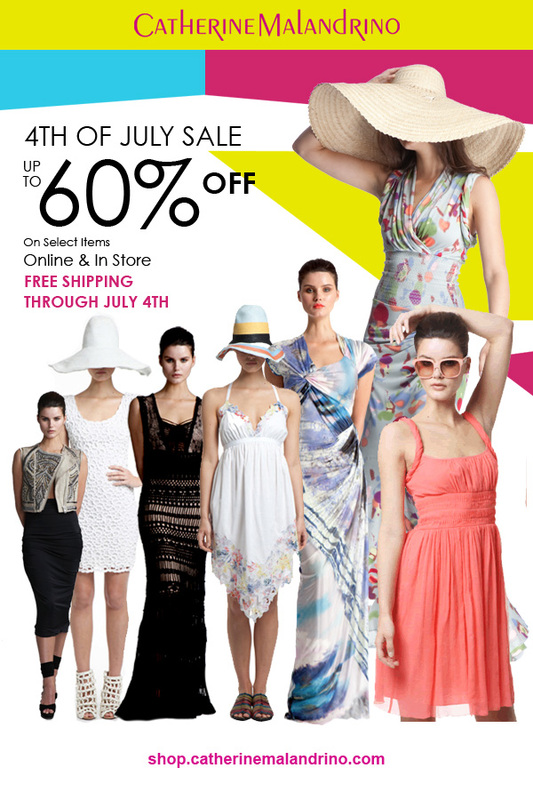 First stop: the MyTheresa.com summer sale. Up to 50% off pre-SS items. Barney's has stuff up to 40% off now. Soho boutique Kirna Zabete has started their summer sale. Up to 30% off either in-store or online. Not a whole lot of detail, but Soiffer-Haskin will be hosting a mens and womens sample sale for Ralph Lauren next week. They'll have apparel and accessories from the Cruise and SS collections. 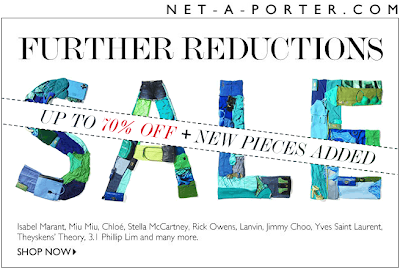 ShopBop's top names, like Anya Hindmarch, Herve Leger, Derek Lam, Matthew Williamson, to name a few, are on sale.